Eggpreneur is thankful for the people from all walks of life who contribute to the work of reducing poverty in Kenya. Three years ago, three men in Guelph learned about Eggpreneur and became passionate about finding a way to contribute to our work. These men also had a dream to build a canoe together. So, they combined those passions and, after 2 years, and many hours of sweat, construction, and sanding, a beautiful handcrafted wooden canoe emerged. The canoe was completed in November and it was auctioned off at a fundraising event for Eggpreneur. Matt with two of the men who built the canoe. The event was a wonderful time of sharing about the work of Eggpreneur among the larger community and working towards a common goal of building awareness and financial support for Eggpreneur. Monies raised for Eggpreneur go towards various projects including the training of women in poultry management. See our gift guide for other projects you can partner with us in during this Christmas season. Recently, we shared with you the story of the tornado and it’s damage to our main chicken barn. Maintaining operations at Eggpreneur has been challenging; however, we have managed to gather our courage and energy together to continue the work. We would like to thank all those who have donated towards rebuilding a new barn. In the midst of the storm, we have seen another Eggpreneur champion rise up out of poverty with a flock of 500 birds. We spoke about Anastacia at Christmas time, and we wanted to share with you a more detailed, first hand report of her progress. We sat down with Anastacia last week to hear her story of trial and triumph. I am Annastacia Ngina from Machakos County, Kithini village. I am a widow and a mother of 4 children. After my husband died, life became tough and I had no job or any source of income to feed my family. I struggled everyday looking for casual work in the village to get money for food. When I heard about the Eggpreneur initiative, a project that creates self-employment for women, I was excited. I immediately registered for the poultry training with high hopes that my children’s life would change for the better. using the actual birds at the Eggpreneur demonstration center. I kept my notes from all the programs on feeding and vaccination. In February 2016, I passed my final exams and graduated, my poultry journey had begun. After my graduation, the chicken coop was built by Eggpreneur and I received 150 ISA Brown layer birds. These birds needed a lot of attention and care. This was a challenge for me, as I had no one to help with other family activities and my children started going to school. I lacked time for my birds. This led to less income than expected and sometimes I incurred losses. I had to find a solution. I spoke with the project managers at Eggpreneur about my challenges and was advised to switch to Kuku Kienyeji birds, a meat bird breed which is easier to manage and still lays some eggs. This is where my success story started. These birds grow fast and I am able to sell them as meat birds within a cycle of three to four months. I keep a few hens to lay eggs for the family. I also sold the eggs as table eggs to the market. I did hatch a few chicks,which helped me grow my chicken flock to 500 birds. I can sell each bird at $8-10. Finally, I was confident of a stable source of income for my family’s needs. Not all of us can succeed in the same thing but the most important is to learn what suits you and to never lose hope. At the moment, I am able to provide good food for my children, pay school fees, pay all other house bills and have readily available, delicious, fresh eggs as a source of protein for my family. I am grateful for the opportunity I have received through Eggpreneur Initiative. At Eggpreneur, we are really grateful for each of you who help us to be change agents starting in the home, which spreads to the village, community and entire country. If you would like to support a mother like Anastacia please donate the link below. We are still short some funds to start rebuilding another barn, but we do hope with your support we can get this work started soon. Thank you. Pennina is a young mother of three children. Her husband died 4 years ago and left her with one and a half acres of land. Pennina struggled to pay for her children's school fees, health care costs and food. Before she joined Eggpreneur, Pennina stayed home, gardening and cultivating land to grow corn. Some of the corn would be used for family consumption, the surplus would be sold to give her income of $20-30/month. Living on less than a dollar per day, Pennina relied on the generosity of friends and in-laws to survive. Pennina joined the first group of Eggpreneurs in 2016 and was trained in basic poultry management, financial literacy and child nutrition. She received 200 chickens and a chicken coop. The Eggpreneur platform purchased her eggs and brought them to market. Pennina paid for the chicken feed from the profits of her eggs. Pennina is a determined and feisty young woman. Soon after she began with the program, she told me she wanted to double in size. Partway through the year, Pennina received another 50 chickens because she was so diligent with her care, had low mortality rates and had high production rates. Now Pennina earns $90-120/month from egg sales and does not need to rely on other’s generosity. She is able to send all three of her children to school and her children have a more varied diet, including plenty of protein from eggs. In 2017, Pennina received 320 egg laying hens and 80 meat birds through the kukupreneur program (a local chicken breed bird raised for 3 months and sold for meat in restaurants). Not only has Pennina multiplied her income and her chickens; she has also multiplied her confidence, independence, and self-esteem. We are so thankful for Pennina - a true Eggpreneur. Lots of exciting changes have been happening at Eggpreneur. We received new chicks in early summer and they are growing into pullets (ready-to-lay hens). The Women Eggpreneur's will be receiving these new pullets to replace their older hens. The older hens will then be sold at the market. The women have developed many agricultural skills over the past 18 months and many women are interested in expanding their flocks with these new pullets. The much anticipated rains came in the spring and now the crops are being harvested. We are so thankful for the end of the drought which was causing a great deal of suffering and even death. We have been contacted by members of a neighbouring community who were inspired by the work and impact of Eggpreneur and are requesting expansion into their community. Finally, We are continuing to look for donations for a bore hole so that we do not have to purchase water in the driest periods of the year. Unexpected Consequences bring New Hope in the Midst of Extreme Poverty. As Easter approaches, I am reminded of the hope we have in new life. In Kenya, the rains come at this time of year, and we see the barren land erupt into a profusion of growth and colour that bring the promise of new life. Development projects also bring new life and hope through change, but not all of the effects of projects can be anticipated. These unintended consequences can be negative or positive. Nduku’s story demonstrates the positive effects that the development of Eggpreneur has had on the local community. Nduku is now an extremely loyal, diligent and hardworking employee at the Eggpreneur base farm. With regular access to eggs and steady income, her children are clearly thriving and no longer have the obvious signs of malnourishment. Nduku lives with her four children in a leaky 10x10 foot room. The roof is weighted with rocks to prevent it from blowing away. The kitchen is a separate shack constructed from branches and plastic and cloth scraps. The ‘structure’ which was her bathroom, has blown away. But Nduku has hope and she is dreaming. From each pay period she saves enough money to buy two sheets of tin metal for a two room house she wants to build. Nduku only went to school up to grade 2, and some of the local shopkeepers have taken advantage of her illiteracy and charged her inappropriate amounts for her maize, beans and tin sheets. But Nduku is beginning to attend portions of the Women Eggpreneur trainings – and she is learning more about business and money management. When the vision of Eggpreneur was being born, I dreamt about the changes it could bring to the Women Eggpreneurs, I wasn’t thinking as much about the effect the employment on the base farm would bring to the local community. Being blessed by Nduku’s cheerful smile and knowing her children are fed and in school energizes me each day. Exchanging knowledge is an important part of Eggpreneur’s mission. When we train women to care for chickens, we are transferring knowledge about poultry management to empower women to change their lives. The women also learn about money management and investment. In return, the women will share their needs and suggest new ideas to make the initiative more effective. As we grow and learn together, the Eggpreneur program continues to meet the unique needs of the poor. Knowledge exchange can flow in many different directions. I was recently in Canada where I was privileged to share the Eggpreneur story with elementary school students in several different schools. The students were insightful and passionate about Eggpreneur and learned how Canadians can influence the world and also learn from other cultures and countries. 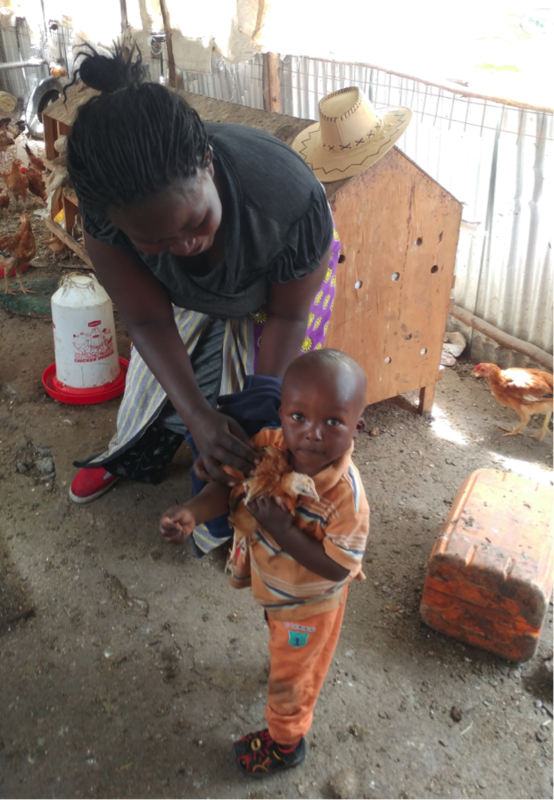 As Eggpreneur expands, we have heard from the women that obtaining water is a difficult and limiting factor in their ability to care for their chickens. Many women are having to carry 20L of water 5 times per day; Each trip is a 3km journey. Eggpreneur would like to drill a bore hole in order to provide easier access to water for both the Eggpreneur women and the rest of the rural community in which they live. The bore hole would significantly reduce the amount of walking to less than 1 km for a round trip to obtain water. We can only imagine the joy and happiness in these women’s lives when we can share this news with them. Our budget for this bore hole is $25,000 which also includes a solar panel to operate a submersible pump that can bring water up from 500ft underground to an above ground storage tank. We would also like to develop a manual feed mill. Accessing quality feed in Kenya is very difficult, despite plenty of raw materials. We can significantly reduce our cost of production and increase margins for the Eggpreneur program by combining our own feed rations. Furthermore, if we control our feed supply, we can ensure that quality feed is produced that contains enough protein to develop healthy pullets and to maximize egg production. Our budget for the feed mill is $47,000 and this also includes a small building to secure the equipment and the feed that has been mixed and is ready to be distributed to the women. We are eager to continue developing Eggpreneur through these two projects and it should also be noted that all equipment and labour for these 2 projects will be sourced locally. Would you consider donating towards the development of these projects? Over the past year, Eggpreneur has been blessed to work with young mothers, adolescent girls and rural women groups across Machakos County in Kenya. Through our Eggpreneur model, we have been able to provide stable family incomes, a nutritious food source and employment through chicken farming to many families. We were able to bring our first egg products to market and they have been well received. As the year progressed, we witnessed changed lives and improved quality of life through development of Women Eggpreneurs. At the beginning, chicken coop management was a challenge for most Eggpreneurs. However, with closer follow-up, technical support and creating a peer support network, our team has helped women develop a 75% laying efficiency each month. As a result of this challenge, we realized the value of having the most successful Eggpreneurs mentor new women coming into the program. These women support each other with fundamental knowledge about the business, but they have also created a network of strong and supportive friendships that has increased the resiliency of the communities. The community is watching these Eggpreneurs perform and improve their quality of life, as a result we continue to receive weekly inquiries about women joining our program. Praise God for this success. In our performance analysis, we have recorded great results for some Eggpreneurs who are earning between $35 and $80/month. Prior to joining Eggprenuer, these women were crushing stones into gravel and earning $30/month. Some women are struggling to make a profit and so we have substituted their layer birds with indigenous meat birds. The women raise the chickens for three months and then Eggpreneur purchases them for resale. The free range indigenous meat chickens require less intense management and the women are demonstrating good results with them, thus continuing to provide additional income for these families living in poverty. We are now working through our challenges with some innovative solutions. One of them is accessing a steady and affordable supply of quality chicken feed. Feed can often come at a high cost and is not always readily available, even though inputs like corn are very accessible in Kenya. Eggpreneur is raising money to purchase a simple feed mill, in order to stabilize our feed supply, improve the quality of feed and minimize our operating costs to ultimately increase the profits of Women Eggpreneurs. Christmas is a time to show acts of kindness toward those who are less fortunate than ourselves. During this season we aim to reach 200 families with an Eggpreneur solution. $100 will support the training of five Eggpreneurs. we are also asking for donations to help fund a simple feed mill that we hope can be purchased in early 2017. I wish you and your family a blessed and peaceful Christmas season. We are humbled to share our simple journey of one Egg to a Global story; the story of Eggpreneur touching lives and improving impoverished families. NBC news is recognizing the work and changes that we have started to make at Eggpreneur - this is only the beginning! Each Eggpreneur is trained in the management of her own chicken coop. Upon completion the course, the women receive a certificate in Basic Poultry Management. Here we are celebrating the successful completion of the course for seven woman. What came first, the chicken or the egg? To Eggpreneurs it doesn’t matter what came first, what they do know is that the egg has economic power to transform their lives for good. While up to 70% of rural Kenyans are engaged in subsistence agriculture as their principle livelihood, the Eggpreneur Initiative is leveraging this statistic to create a local solution to a generational problem. Eggpreneur creates opportunities for women to develop their livelihood through the use of micro-egg production using a sustainable business model to improve household income in the poorest regions of Kenya. In our second year of operation we have started realizing this Eggpreneur vision. The Eggpreneurs are improving their standard of living, meeting and exceeding their basic household and food security needs while contributing to the larger goal of community building. By March 1st, 2016, every Eggpreneur had her chicken coop ready and full with 150 active pullets. Each woman was also prepared with poultry skills and layers feed. With great anticipation, they were ready to begin the journey of becoming true Egg farmers and successful business women. We’re striving to create new and innovative ways to address daily challenges. Our immediate challenges have been: 1) High demand for eggs- We cannot satisfy our customers demand with the current production. By July, when our second flock of 4500 chicks will start laying, we will be able to meet the demands we are receiving every day by industries. 2) Bacterial DiseasesOur egg shortage was partly due to the adverse effects of coccidiosis disease (caused by wet litter) acquired by some pullets. Upon consultation with our veterinarian, the pullets were treated and are currently regaining their weight and increasing egg production. We’ve managed to implement dry grass and dry beans stack as reliable and affordable litter material for chicken coops rather than wood shaving to keep the chicken coop dry at all times. In the last month we have realized that our Eggpreneur fresh eggs are doing very well in the marketplace due the quality of our eggs and the consistency of our customer service. We are supplying our eggs to four and two star hotels and the largest Supermarket/store chain in Machakos county. In the month of April we were privileged to receive our Eggpreneur sponsor and supporter from Peterborough, Ontario, Canada! The couple came to visit Eggpreneur and witnessed first-hand the impact of Eggpreneur Initia tive. They had a wonderful time interacting, asking questions of women Eggpreneurs and took pictures with the children who have been eating eggs every day (which was rare for them before their mothers became Eggpreneurs!). We hope to employ 40 new Women Eggpreneurs (our 2nd flock) by July 2016. Complete Poultry Training sessions followed by the construction of chicken coops and distribution of pullets. Share more information and data with our stakeholders, supporters and volunteers to learn and improve the project. In May, Matt was able to present the Eggpreneur project to Echoing Green in New York City. Echoing Green is an agency that supports and helps social entrepreneurs. Eggpreneur was 1 of 19 finalists to compete to receive financial and educational awards from an original pool of more than 2700 projects. See the website! 2. Online through Canada Helps at: https://www.canadahelps.org/en/cha rities/lakeside-hope-house NOTE: Please select “The Eggpreneur Project” from the drop down menu to ensure the funds are directed to Eggpreneur. A charitable tax receipt will be issued for donations over $25. Lakeside Hope House will forward your donations directly to The Eggpreneur Project in Kenya. Thank you for your support! Everybody at Eggpreneur farm had been eagerly waiting for the second born babies. The preparation of the brooding house had been done, now with experience and good care as learned from the first chicks. The preparation had some wood shavings and newspapers to ensure there was enough ventilation and warm brooding rings. Every brooder ring was surrounded by bales of grass and wood shavings to prevent cold from penetrating into the rings. Jumping from 2000 chicks to 4500 chicks was like doubling the number of births from the first round. All the chicks arrived safely, they were healthy, happy and excited in their new environment. In addition, Eggpreneur Farm managed to install the solar panels that provide light throughout the day and night and also help with the warmth during the night. Though the caring of chicks may not be as complex as many people think, it needs a lot of care and high standard of hygiene. So far we are doing well with a reduced mortality rate of 0.4% and we are managing it so that it can remain as low as possible. We hope with our past experience, motivated farm workers with skills on how to care for chicks as well as qualified Veterinary officer will raise good healthier pullets. Thank you for your continued support and thoughts about Eggpreneur. What would one do if the long awaited child is born anyway? It indicates some hope and progress in the life circle of the bearer. That was exactly the excitement at Eggpreneur Farm when we saw the first eggs from our pullets. It had been a long wait for the women and every one was becoming more anxious. The common questions had become what could have been wrong with the pullets, if we could be feeding them wrongly, if they needed more time in the laying boxes or if they could be sick. However, we have come to a realization that such questions only lead to unnecessary nerves and frustrations when most pullets need patience and support of the highest degree. As a result, any farmer needs to remain composed, calm, and caring, but not overbearing, anxious, and nervous. The only challenge that is remaining is that the laying efficiency of the pullets is still low. However, we expect that by the end of this week most of them will be laying, since 80% of the hens have already gained the necessary egg laying weight. With the onset of the laying, we ready to issue the pullets to the trained Eggpreneurs. With such, Eggpreneur Initiative is doing well in its effort to attain set goals in accordance with its vision and mission statements. When Matt Dickson began the MSc Global Health program at McMaster, his intention was always to return home to Kenya, where he hoped to one day make a difference in the country’s rural communities. Today, he’s doing just that. In January 2015, Dickson started Eggpreneur, a social community project that supports sustainable egg production at a remote rural homestead in Kenya. What the program helped him do was to prepare for the opportunities ahead. “The program opened my mind to critical thinking, international development and strategic planning to tackle the most pressing global health issues,” says Dickson, who explains that the program inspired him to think more about child malnutrition, a major global issue that leads to negative health outcomes for millions. “So many children are mentally and physically disabled due to poor diet in their earliest months of life. I wanted to do something about it,” he says. For Dickson, Eggpreneur represents his chance to give back. Having witnessed poverty and experienced it first-hand, he is thankful for the education, training, and connections the program has afforded him. “The whole reason I joined McMaster was because I wanted to be one of the leading young scholars tackling the quest for ending extreme poverty and malnutrition,” says Dickson, reflecting on his decision and the peers with whom he worked collaboratively throughout the program. It seems only fitting that fellow McMaster GH graduate Faye Stoter has recently joined the project, helping to make Eggpreneur a success. To support the Eggpreneur project, you can donate through Lakeside Hope House in Guelph (Please reference 'Eggpreneur' on your cheque/payment memo or select Eggpreneur online).